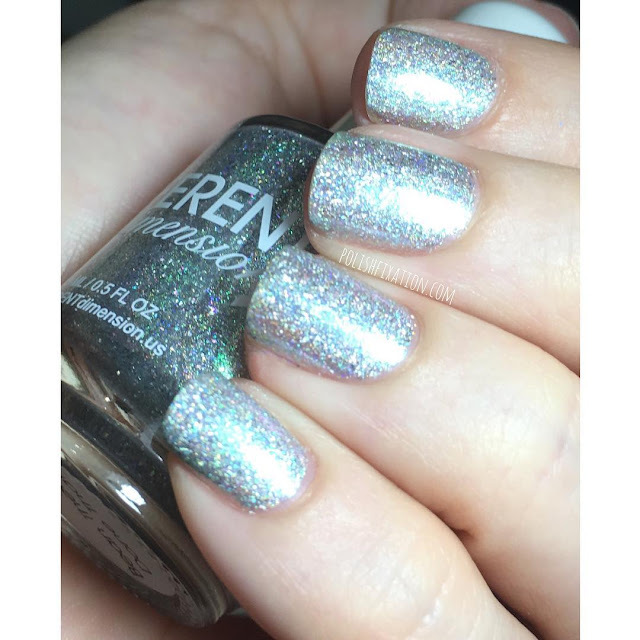 Today I am sharing an amazing polish with you from one of my favorite indie brands, Different Dimension. It is one of the special Polish Con colors, called Bean There, Done That...and OMG it is freaking amazing. Missy never fails to impress me with what she comes up with! How incredible is the wow-factor on that? Pictured is two easy coats and a glossy top coat. The formula is smooth and easy to apply. I loved how this came out as silver/gray and pink is one of my favorite color combinations. 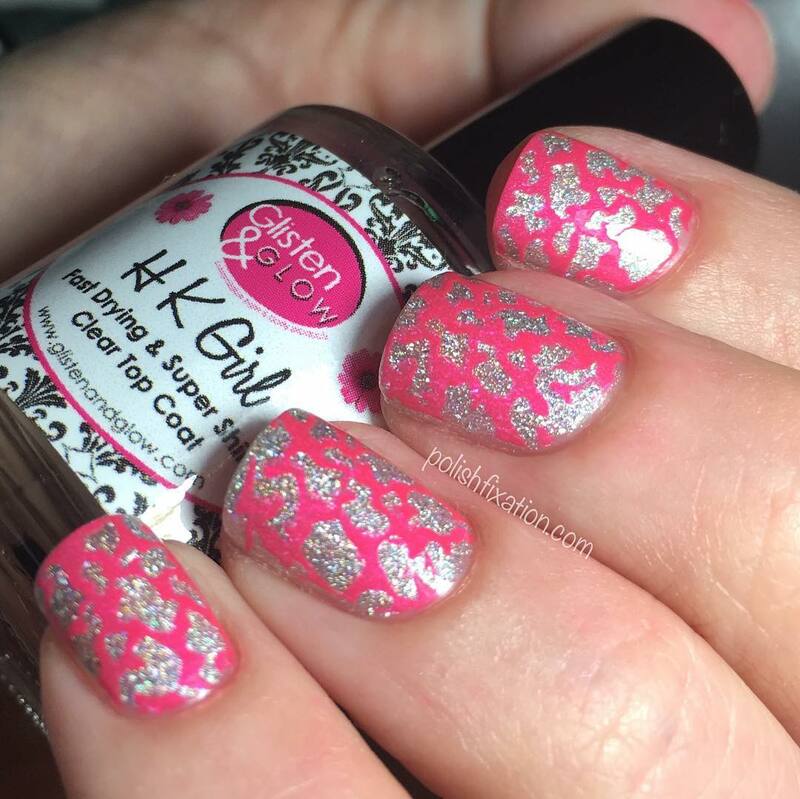 The stamping polish I used was HITS brand Pink. I don't remember which plate I used but if anyone asks about it I will gladly look at my plates to try and figure that out for you! That's all for today, hope you enjoyed! IF you were lucky enough to snag a bottle of Bean There, Done That at Polish Con let me know if you love it as much as I do! Hey guys! I know it's been way, way, WAY too long since I have updated this blog! I won't bother going into all the craziness that has been going on in my absence...suffice it to say that "Life happens"...and many ups and downs were gone through...but now I am back and wanting to ease back into sharing my swatches and nail art with you again! I was definitely out of the loop for a long time but luckily I have some amazing polish friends who informed me that Polish Con 2016 was happening in Chicago...which just so happens to be where one of those friends lives, so if I was able to attend I would have a place to stay! So I got a plane ticket and an event ticket and off I went a few weeks ago, and it was SO TOTALLY WORTH IT! 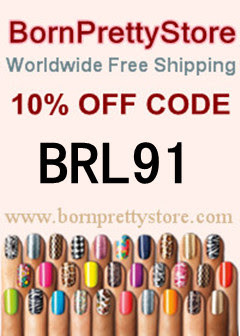 I had never seen so many amazing polishes in one place, OR that many polish fanatics either! It was like a dream world! I got to meet and chat with a lot of my favorite indie polish makers like Pam, the mastermind behind the Girly Bits brand, and Missy, the creator of Different Dimension...among many others! It was hard not to go completely broke at the event cause there was so much more I would have bought if I had the funds for it! So here I will share a pic of what I did go home with, some of you may have already seen the picture on my instagram, where I've been posting a lot more lately. And here is a random shot I managed to get to kind of give you an idea of just how packed the venue was! It was definitely putting me on sensory overload, but I stuck it out cause it was worth it! The really cool thing is that it's been announced that going forward this Polish Con will be held annually in the fall in Chicago, and also annually in the spring at varying cities... the Spring 2017 venue is going to be NYC! Which excites me because my family lives there so, once again, if the date chosen is free on my calendar, I will have a free place to stay = more $ for polish! I hope some of you can make it to future cons because they are fantastic! So anyhow, please keep an eye out for posts from me coming up, as I am going to work on getting content on here for you again, and please if you don't already follow me on Facebook and Instagram, please hook up with me on those as well, to make sure you have easy access to anything I am sharing! To those of you still out there, thanks so much for reading and sticking out my hiatus! Hi everyone! Sorry I missed a few weeks, the end of the summer got super busy between going away for a week and then having my niece and nephew come visit me for another week. Now school is back in session and fall is just around the corner! I will miss summer, but I do really love the fall! Anyhow, today I have the next two polishes from the Soulstice Spa Sonoma Collection to share with you. Today's are called Guerneville and Healdsburg! Guerneville is a very unique rustic green shade. It's very glossy and looks mostly like a cream in the bottle, but on the nail it reveals a very subtle almost speckled-like shimmer. The formula was great, and opaque in two coats. Healdsburg is a gorgeous orange shade with a hidden copper/red shimmer. I didn't even realize it was a shimmery shade until it was on my nail. I was so pleasantly surprised. This color is perfect for fall and turned out to be one of the stars of the collection for me. Great coverage and formula, two coats pictured. I still have the last TWO shades coming up next week! Soulstice: Jenner & Bodega Bay! Anyhow, today I have the next two polishes from the Soulstice Spa Sonoma Collection to share with you. Today's are called Jenner and Bodega Bay! Jenner is a creamy neutral pink-toned lavender. The formula was really opaque and I probably could have made it in one coat, but I did two for these pictures. I don't typically love neutrals but this one is super pretty, and I liked how it looked on me. Bodega Bay: Immortalized by the Alfred Hitchcock film, "The Birds," Bodega Bay is a scenic seaside town in Sonoma County. With wonderful whale watching, fishing and beach-combing, this sweet enclave will charm you with its misty mornings and sea-salty air. Bodega Bay is a vibrant, cool purple cream. My pictures lean sort of bluish purple due to the camera having difficulty with certain shades of purple, but it is definitely more of a purple than a blue. The application was a breezy, easy two coats. There are still FOUR more shades I will be sharing from this gorgeous collection, so stay tuned! Good morning everyone! Hope you're all having a great week so far. The weekend is almost here and I couldn't be happier, especially because in a few short days I'll be heading to PA on a family vacation. Do you have any cool plans coming up? Today's post will feature the next two Soulstice Spa colors in the Sonoma County collection, Santa Rosa and Kenwood. Both of these are lovely shades of pink, and two of my favorites in the collection! Santa Rosa: The county seat of Sonoma County, fifth largest city in the San Francisco Bay Area and center of Sonoma Wine Country. With a mild Mediterranean climate, historic neighborhoods, and rose-lined streets, Santa Rosa is a vibrant gateway point to explore the region's natural beauty, wineries, ranches and spas. Santa Rosa is a creamy, vibrant fuchsia. The formula was really opaque and I probably could have made it in one coat, but I did two for these pictures. I love how bright and shiny this color is! Kenwood: A charming town along scenic Highway 12 in the Valley of the Moon grape-growing region. Kenwood is known for its beautiful Sonoma Valley AVA vineyards, bistros, and European style resorts. Kenwood is a bright, rosy pink with a very subtle shimmer. The formula was great and I used two coats for this photo, but it's probably also able to coat in one thicker coat if you prefer. This is one of my absolute favorites of this collection! Four down and SIX to go for this collection! Check back next week for two more! Soulstice Spa - New Collection! Hi guys! I know, I know, it's been wayyy too long since I've checked in here with new polish eye candy for you to ogle, and for that I am sorry! What can I say? Life sometimes barges in and gets so busy that hobbies wind up falling to the wayside temporarily. But, I do hope to get back into things here, even if it winds up being less frequent than it used to be. But enough about that, let's get to the awesomeness that is today's post! I am super excited to share with you, over the course of a few weeks, all the new shades in Soulstice Spa's latest nail polish collection, which consists of 10 shades inspired by and named after Sonoma County towns (where Soulstice Spa is based!). Today's post will feature the two softest, sheerest shades in the collection: Sonoma and Petaluma. Sonoma county, which this polish is named for, is internationally known for its sweeping vineyards, historic Missions, soft, fragrant air and award-winning wineries. Sonoma is a creamy, sheer peachy pink. Soft, subtle and delicate, but really gorgeous! I love the shine of this one. Pictured is 3 coats, and you can still see that it is very sheer but I think that gives this polish a nice clean and refreshing feel. I think with one more coat you could achieve full opacity, but I really preferred to leave it at three cause I was really digging it at this level of sheerness, so I left it. Petaluma is a quaint, small town famous for its Butter & Eggs Day. This polish is a soft buttery yellow inspired by its long history of poultry farming. As you can see, Petaluma is bright and cheery yellow with a gorgeous pink shimmer. This is also a sheer sort of shade, and I used 4 very thin coats for the pictured look, but you could probably do 3 thicker ones, I just prefer to do them thinner. I think it's also important to note that the formula was really easy to work with and wasn't sticky or streaky at all, which I find is sometimes a problem with yellow polishes for some reason. Overall, I am not usually one to wear yellow very often, but if I had to pick one, this would definitely land among my favorites in that category! There are 8 more shades in this collection that I will be sharing with you over my next few blog posts and I can't wait 'til you see the rest! Dream is a perfect name for this polish by Zoya because it really is a dream! Perfect application and stunningly gorgeous!